On the back of a big night from Dejounte Murray and improved defense, the Huskies were convincing enough to surpass Stanford, 64-53, to end a four-game losing streak. With a 13-point lead and 40 seconds to play, Andrew Andrews stole the ball from Stanford’s Cameron Walker and flipped it to a wide open Dejounte Murray on the breakaway. Murray went vertical, tomahawking in a dunk to cap off a dominant 25-point performance. Murray didn’t have to, but wanted to. It was part of the statement the University of Washington men’s basketball team made with a 64-53 victory over Stanford Saturday at Hec Edmundson Pavilion. The game marked a turnaround for Murray and the Huskies (16-11, 8-7 Pac-12), who snapped a four-game losing streak after overcomng initial struggles with Stanford’s (13-12, 6-8 Pac-12) unusual 3-2 zone defense. 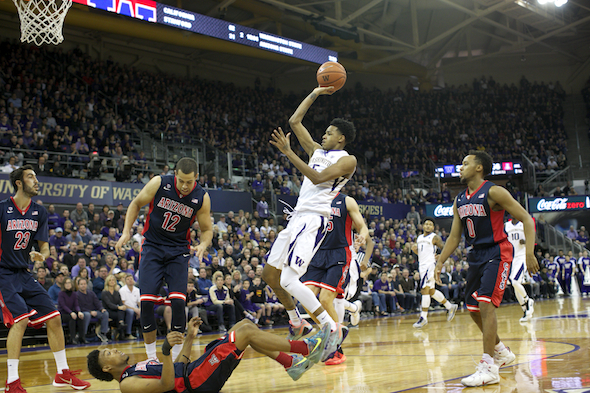 Still, the game wasn’t quite the emphatic response the Huskies had hoped for. Washington tied a season low in points scored, and finished 40.8 percent from the field, including 3-of-22 on long-range attempts. While the offense was shaky, the Huskies pulled away on the back of sturdy defense. Leading by four with 5:12 to play, Washington forced the Cardinal miss seven shots and commit two turnovers on the lead-up to Murray’s good-night dunk. It was a good thing that the freshman guard found a way to score, since four teammates — Noah Dickerson, David Crisp, Dominic Green and senior captain Andrews — went a combined 0-of-18 from the field. Andrews’ 0-of-4 was softened by six assists and eight points from the charity strip. He was hampered by an MCL strain he picked up in Thursday’s loss to Cal. Murray’s other support came by way of the alley-oop. Forwards Marquese Chriss and Malik Dime scored 11 and 10, respectively, with Dime scoring eight of his 10 on dunks. The Huskies used the lob-jam to force Stanford out of its ring-like defensive structure to account for UW’s lateral movement in the low post. Andrews, who set up a number of the highlight-reel plays, said the play was part of the game plan. “We knew going into the game (that the dunk would work),” said Andrews. “It’s a little different when you go over a scout . . . and then you get out there and they’re a little bit bigger and a little bit longer, and so it takes you a little period to adjust . . . it’s a matter of getting comfortable and making some passes and getting on the same page. Andrews’ confidence must have been sky high at the start of the second half. The first two possessions, he pulled off identical alley-oops to Chriss coming in from the right side. In response, Stanford was forced into a more traditional 2-3 zone, allowing more room for the guards to drive into the lane. Murray capitalized, going 4-for-4 from two-point range in the second frame. Washington’s defense forced 20 turnovers, its third-highest tally in conference play. While Romar was unhappy that his team committed 17 of its own, he was pleased that the Huskies came away with a 10-point advantage in points off turnovers, including a 13-0 advantage on fast breaks. Romar said that the game represented improvement, but not the resurgence he still expects. They’re not dead in the NCAA water, but they’ll need more paddling as they travel for two difficult road contests against Oregon State (15-9, 6-7 Pac-12) Wednesday (8 p.m., ESPNU) and No. 16 Oregon Sunday (5:30 p.m., ESPNU). A road sweep, while unlikely, would send a much stronger message to the rest of the conference and the tournament selection committee that Romar’s Huskies are the real deal. Stanford was led by senior forward Rosco Allen, who scored 20 off a 7-of-17 performance from the field in 39 minutes. No other Stanford players hit double digits. Bleacher Report put out a story that Andrews is playing with a strained MCL which explains his lower than usual production lately. If you read Andrew Harvey’s story, you would have seen the reference to the injury, with a link. What are you doing reading Bleacher Report? A shot, Art, a definite shot. Um…um….did I say Bleacher Report? I meant to say Harvey’s Report. Yeah…that’s what I was gonna say…. I sure hope Murray comes back next year & adds some outside shooting range. He most likely isn’t a first round pick this year, so that shouldn’t be an issue. This team is capable of winning games when they force turnovers & get easy fast break points, they need that to succeed due to their lack of shooters. They need to basically win out & make the finals of the conference tournament or they’ll be NIT bound. That would be disappointing. I have no specific knowledge of Murray’s intentions, but few kids of his talent can resist, even when logic and truth are heavily applied. ❝my .friend’s mate Is getting 98$. HOURLY. on the internet.”….two days ago new McLaren. F1 bought after earning 18,512$,,,this was my previous month’s paycheck ,and-a little over, 17k$ Last month .,3-5 h/r of work a day ..with extra open doors & weekly. paychecks.. it’s realy the easiest work I have ever Do.. I Joined This 7 months ago and now making over 87$, p/h.Learn. More right Here:;/72➤➤➤➤➤ http://GlobalSuperEmploymentVacanciesReportsJobs/GetPaid/98$hourly…. .❦2:❦2:❦2:❦2:❦2:❦2:❦2:❦2:❦2:❦2:❦2:❦2:❦2:❦2:❦2:❦2:❦2:❦2:❦2:❦2:❦2:❦2:❦2:❦2:❦2:❦2:❦2:❦2:::::;/72..